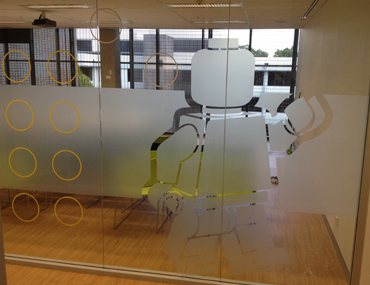 Add a touch of confidentiality to your glass meeting room walls by adding window frosting film. With the ability to have a decorative pattern similar to artscape window film cut in, you can even add a touch of design while you’re at it! Window frosting is a great way of improving the privacy of your bathroom. Unlike traditional window coverings, window frosting film will still allow natural light to pass through too! Window frosting film is useful have things like names, directions or instructions etched into doors or windows. And because they are fully removable, it’s easy to maintain, should you need to change them. Contact us for an obligation free sample or to learn more. We’re happy to walk you through your options and can even provide a free measure and quote to get you started.